A significant step in the Channel Tunnel construction programme occurred on 12th February 1986, when the British and French Governments signed the ''Fixed Link Treaty'' in Canterbury. This was subsequently ratified on 29th July 1987, marking the official commencement of tunnel building work. The final dedicated "international" route which the line would take between the Kent coast and London had yet to be decided, as had the type of passenger rolling stock which was to traverse it. A period of thorough consultation ensued between British Rail, Societe Nationale des Chemins de Fer (SNCF: French National Railways) and Société Nationale des Chemins de fer Belges (SNCB: Belgium National Railways), to agree on a passenger train design which would be compatible on all three railway systems. The trio had agreed with the Channel Tunnel Group/France Manche - the Chunnel's funding consortium - to utilise a portion of the proposed available paths. The complications of developing a train capable of running on no less than three separate voltages were compounded by the need to conform to the comparatively restrictive British loading gauge, not to mention the reluctance of each of the three national railway bodies to alter their long-standing operating practices and regulations to accommodate the then new international rolling stock. The British interest in the project was handled by a subsidiary of British Rail: European Passenger Services. In late 1987 the ''International Project Group'' (IPG) was formed by the three rail bodies to consider various concepts and finalise specific requirements for the ''Trans Manche Super Train''. 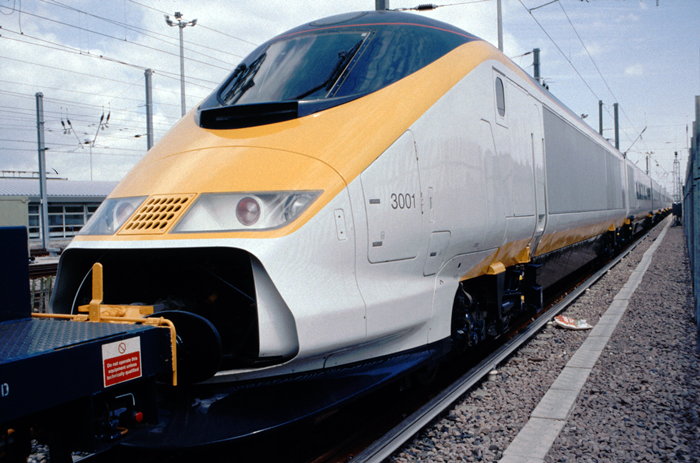 From the outset, the French TGV (Train à Grande Vitesse) was promoted as the most desired option, it being a proven high speed electric train, but initially the British had other ideas, looking into a separate locomotive concept. Whilst the TGV model was finally agreed on, individual locomotive-hauled passenger stock did re-emerge as part of the ''Nightstar'' programme, which aimed to run overnight services through the Channel Tunnel from a number of provincial cities. 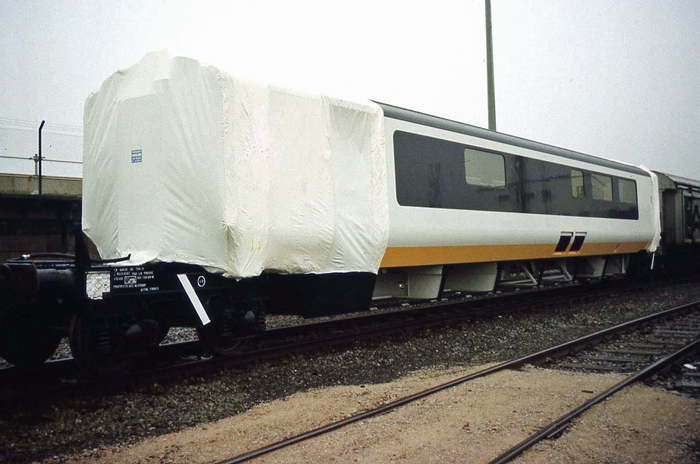 The stock was built, but the project put on hold in 1997, then formally abandoned in 1999 due to rising costs, thus all sleeping vehicles and standard seating carriages were delivered new to MOD Kineton for secure storage. The 18th December 1989 marked the placing of an order with the main selected contractor, GEC-Alsthom, for the construction of thirty full train sets. These were to comprise two "half sets", each of which featured a single power car coupled to nine passenger vehicles, thus creating a train of an incredible length - no less than twenty vehicles long. The capability of splitting a whole train length into half sets met contemporary tunnel safety regulations, thus in the event of a failure or fire in one half, the two portions could be uncoupled (possible by controls inside the train), allowing the still usable section to continue out of the tunnel. The original 1989 order was soon expanded to accommodate eight more trains. One of these was identical to the first batch of units, whilst the remaining seven, ordered in December 1991 at a cost of £180,000,000, varied from the basic specification. Of the latter, these were shorter-formed sets, comprising fourteen carriages sandwiched in-between two power cars, and were destined to operate the "Regional Eurostar" service. The "Regional Eurostar" (also known as "North of London Eurostar") scheme aimed at providing direct international trains to key provincial cities, namely Birmingham, Manchester, and Edinburgh. Shortened sets were to be deployed on these routes, given that most stations were not capable of accommodating trains 394-metres long. In addition, these trains differed electronically from their full-length counterparts, because they had to adhere to 25kV signalling interference criteria set down on those routes north of the capital. However, each power car of every Class 373 set comprised two pantographs: one for the French system and Channel Tunnel 25 kV AC overhead wires (Stone Faiveley), and the second (Brecknell Willis) for the 3 kV DC Belgium system. A retractable third rail pick-up shoe was also incorporated for the 750 V DC network of British Rail's Southern Region. All sixty-eight TMST power cars were built at GEC Alsthom's plant in Belfort, Northeastern France, where SNCF's TGV sets were constructed. An equal number of trailers situated immediately behind the power cars were constructed by French rollingstock manufacturer "De Dietrich Ferroviaire", based in Reichshoffen, Northeastern France. The First Class trailers, of which there were 204, were built by Bombardier Eurorail, Belgium, this company also being responsible for rollingstock construction for "Le Shuttle". The remaining 340 trailers, of which 68 were buffet cars and 272 second class carriages, were constructed at GEC Alsthom's works in Aytre, France (on the Bay of Biscay coast). 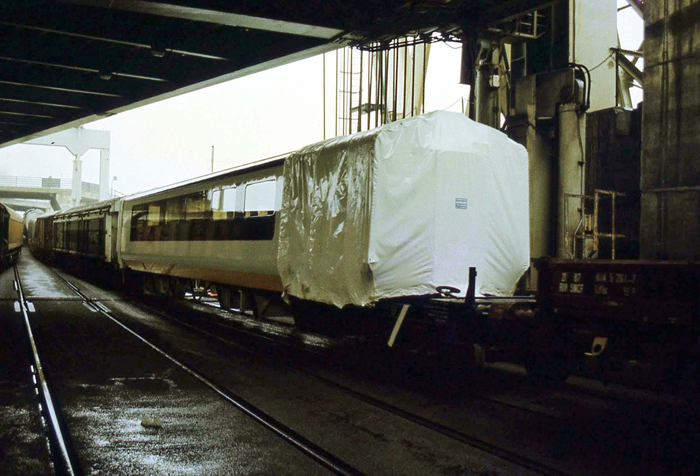 All buffet cars were fitted out at GEC Alsthom's works in Washwood Heath, the first examples arriving on the train ferry to Dover in 1991. Fitting out of all intermediate trailers was split between Washwood Heath and Aytre. Waterloo International was formally completed on 17th May 1993, but the first Eurostar services to Paris and Brussels did not occur until 14th November 1994, each city being served by two trains a day. As a result, Dover Western Docks station was closed on 24th September of the same year, the demise of railway boat traffic being inevitable. By this time, the EMU half sets had been designated on TOPS as "Class 373".